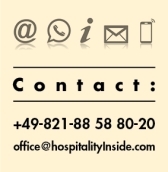 hospitalityInside Information from professional sources. hospitalityINSIDE.com is an online trade magazine for the international hotel industry, launched in March 2005 and based in Augsburg, Germany. The weekly magazine publishes in two languages (German/English) every Friday, focuses on pure editorial content (no advertisements) and geographically on Continental Europe. Of course, the publication includes all global players of the industry. It’s no newsletter publishing (paid) press releases but a journalistic magazine focusing mainly on own research and background articles. The columns pick up topics like investment, financing, marketing, human resources, technology etc. – everything that keeps a hotel group alive. The editorial network consists of minimum 15 journalists and experts worldwide. 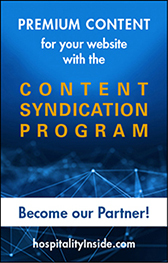 Readers are spread over 20 countries: General Managers, Area Managers, Managing Directors, CEOs, consultants, designers, developers, bankers, investors, leading hotel chains as well as reputable private hotels belong to the “hospitalityInsiders”. Market Check shows the results of surveys, especially of the HospitalityInside Investment Barometer. The "HospitalityInside Think Thank" is the latest projects of HospitalityInside. Here we are creating a community and a plattform to manage the challenges in business driven by digitalisation. The Think Tank project will be launched in 2018. Under the keyword “NETWORK” you find announcements and reports about all event and fair acitivites. The magazine is involved as a media partner in national and international events. 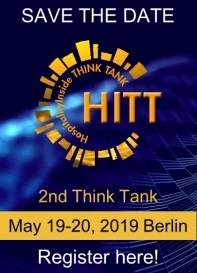 The major hospitality joint platform at at Europe’s leading real estate fair Expo Real in Munich is organised by hospitalityInside, and the editorial team organises the EXPO REAL hotel conference “Hospitality Industry Dialogue”.